DC Comics relaunched Detective Comics with issue #1 in September 2011, as part of The New 52. The series was written and drawn by Tony Daniel until the twelfth issue, with the team of John Layman and Jason Fabok beginning with issue #13. The first issue of the relaunched Detective Comics has received six printings, second only to the relaunched Justice League which had seven printings. 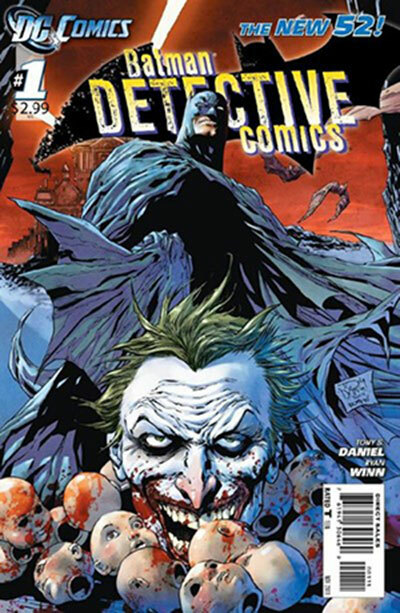 The series seventh issue was also DC Comic's sixth highest selling digital comic, ranking above many other series in the Batman category. Scott West of Sciencefiction.com gave the series' third arc a positive review, stating that "After last month’s disappointing ‘Night of the Owls’ tie-in issue, it’s nice to see ‘Detective Comics’ getting back to where it should be… good detective stories." The relaunched Detective Comics received the award for "Best Series" at the 2012 Stan Lee Awards. The series' first collected edition would reach the number one spot on The New York Times Best Seller list in the category of "Hardcover Graphic Books". Daniel wrote and penciled the series until the Night of the Owls crossover, at which point Ed Benes, Julio Ferreira, and Eduardo Pansica began drawing the series for a three issue arc. 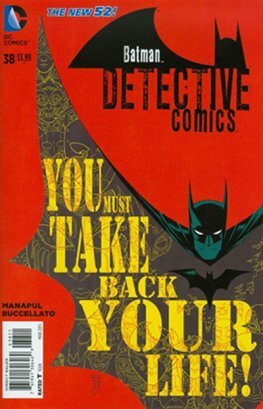 The price of Detective Comics was increased due to the addition of a backup feature starring Batman villain Two-Face, which was written by Daniel and illustrated by Syzmon Kudranski, this followed a similar backup featuring Hugo Strange. Daniel left the series with issue #12 being his last as writer and the "0" issue his last as penciller. DC celebrated the first anniversary of The New 52 in September 2012 by publishing a number "0" of each original New 52 title which act as prequels to the series and reveal previously unexplained plot elements. Gregg Hurwitz wrote the "0" issue. Hurwitz was approached by Daniel to write the "0" issue due to Daniel's busy schedule. To follow up on the Night of the Owls elements in Detective Comics, Daniel wrote Detective Comics Annual #1 which was pencilled by Romano Molenaar and inked by Sandu Florea. Following Daniel's tenure on the series, John Layman became the new writer and Jason Fabok the new artist with James Tynion IV writing the backup features and Syzmon Kudranski remaining as artist for Tynion's first feature. With issue #19 of Detective Comics vol. 2, released on April 3, 2013, the series reached 900 issues as combined with the first volume of the series, and was a special oversized celebratory issue. Under Layman, the series featured its first crossover, Gothtopia after which Layman and Fabok moved to the Batman Eternal series and Detective Comics was taken over by Brain Buccalleto and Francis Manapul. In commemoration of the second anniversary of the New 52, DC Comics announced "Villains Month" with Detective Comics getting four issues. The issues star Poison Ivy, Harley Quinn, Scarecrow, and Man-Bat, and respectively being numbered #23.1, #23.2, #23.3, and #23.4. John Layman and Jason Fabok are not contracted for these issues and are instead replaced by an ensemble of writers and artists. For the 75th anniversary of Batman, issue #27 was a larger-sized issue featuring new stories by Brad Meltzer and Bryan Hitch, Scott Snyder and Sean Murphy, Peter Tomasi and Ian Bertram, John Layman and Jason Fabok, Gregg Hurwitz and Neal Adams, Mike W. Barr and Guillem March, and one written and drawn by Francesco Francavilla. In addition, variant covers to the issue were by Greg Capullo, Frank Miller, Chris Burnham, Jim Lee, Jason Fabok, and Tony Daniel. Single page artwork included work by Kelley Jones, Mike Allred, Patrick Gleason, and Jock.